The Pascaline (Cnam Museum), an early calculator invented by Blaise Pascal. 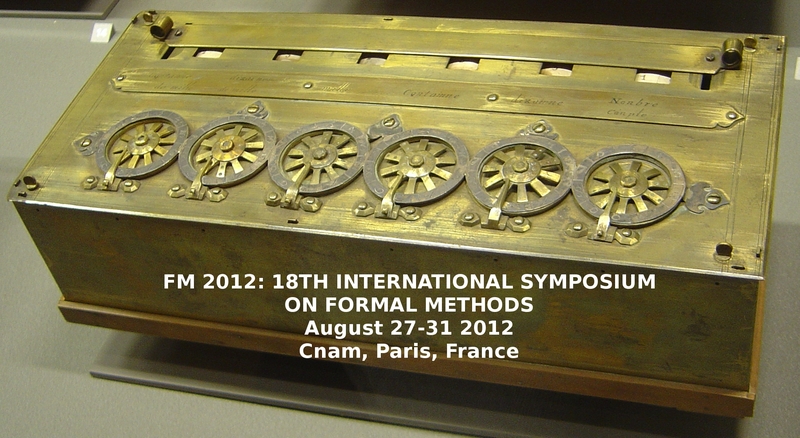 FM 2012 is the eighteenth in a series of symposia organized by Formal Methods Europe, an independent association whose aim is to stimulate the use of, and research on, formal methods for software development. The symposia have been notably successful in bringing together innovators and practitioners in precise mathematical methods for software and systems development, industrial users, as well as researchers. The special theme of FM 2012 is Interdisciplinary Formal Methods, with a goal of highlighting the development and application of formal methods in connection with a variety of disciplines such as medicine, biology, human cognitive modeling, human automation interactions and aeronautics, among others. FM 2012 will be held at the Conservatoire National des Arts et Métiers (Le Cnam) in the center of Paris with the support of the Cnam Computer Science Department and the MeFoSyLoMa group (Méthodes Formelles pour les Systèmes Logiciels et Matériels). The symposium will also host several associated events: Industry day, Workshops, Tutorials, Doctoral Consortium and a Verification Competition.